“Coral Sea” is a new volume in the Campaign Commander series and simulates the campaign in the South Seas of the Pacific between the spring of 1942 and the spring of 1943. The Japanese expansion reaches its limit in the archipelago of the Solomon Islands and New Guinea. The Japanese initial force, the Army of the South Seas, began to expand reducing the boundaries of the Australian defenses from its base in Rabaul, the logistic center of Japanese control in the zone. The naval-air battle of the Coral Sea was a hard blow for the Japanese force since the Soho, their light aircraft carrier, was sunk, and the amphibious invasion force destined to take Port Moresby had to return to Rabaul without fulfilling their mission. Afterwards the imperial forces tried to take Port Moresby by a ground assault, extending their way along the Solomon Islands creating air bases and observation stations throughout the archipelago. The Japanese forces were thus threatening naval communications between the United States and Australia. In response, the Allies reinforced Australia and the New Caledonia zone looking for an opportunity to counterattack and to stop the imperial tide extending through the region. The return to Australia of veteran units from the Middle East allowed the Allies to initiate an offensive in Papua/New Guinea that would last six bloody months and result in the Allied recovery of the enclaves of Buna and Gona on the North coast of New Guinea. In the Solomon Islands the North American counterattack began August 8th, 1942 and led to a lasting and bloody campaign through February 1943, with successive attacks and counterattacks of both sides resulting in Guadalcanal Island back in American hands. In addition to the ground forces, the region saw much use of air and naval operations. Both navies accomplished herculean tasks to support their respective ground forces and supply them. Their importance was noticeable, so air attacks on navies were numerous, and expensive in lives, planes and ships. The last of them in this period was the battle of the Sea of Bismarck, which resulted in Allied air supremacy in the region. The Japanese Imperial navy based on the island of Truk made several raids in the region to support the small naval forces in the South Seas. But eventually the Japanese had to yield the initiative to the allies in the region as they exhausted their resources, fighting on two fronts. The Allies exhausted the Japanese offensive, and they prepare to take their own offensive. The game is developed in an operational scale – area-based map with a scale 1:300,000. It is designed for two players with one running the JAPANESE forces and the other the ALLIED forces. The game lasts approximately 3-4 hours and uses a two sided system to handle the mechanics of play: cards and counters. The players will have to use their troops and their resources to obtain victory points while eliminating enemy forces and occupying cities in the map. 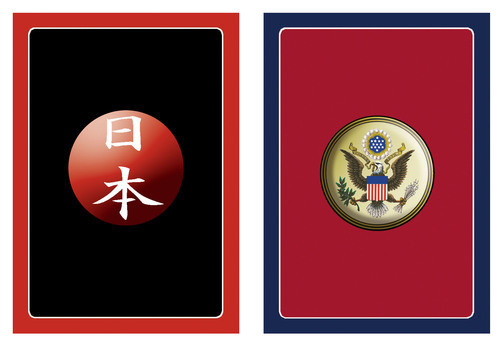 It is not a card driven game as the cards are used to bring about events that influence battles, secure reinforcements, and provide resources with which to carry on the fight. In the beginning of the game the JAPANESE player will take the Initiative and will have to expand throughout the map to secure Victory Points. The ALLIED player is on the defensive, and will have to strength his forces as the game progresses. He will have to take advantage of every opportunity to inflict damage on the advancing Japanese forces. 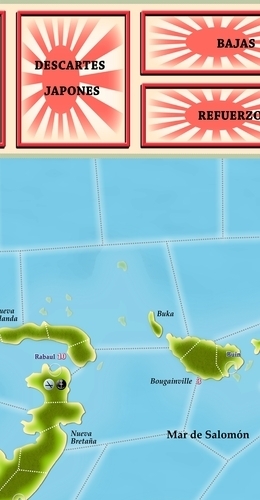 The island of Guadalcanal will be crucial as the game develops, as are the results of actions in Papua/New Guinea. 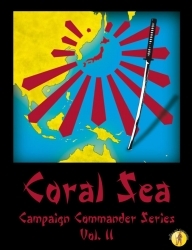 The JAPANESE player must face the historical dilemma of concentrating on taking the Solomon Islands, Papua or both simultaneously. The ALLIED player will have to be patient and force his opponent to extend himself, by accumulating forces and to committing lethal offensives that put the forces of the Empire of the Rising Sun in check. Like all the games of this Series, the rules are simple and straight forward. Our objective was to create games that are very interactive, and offer players a pleasant creative experience. We aim for solid games for players who do not have the time or the space to leave a game setup and in place over a long period of play. 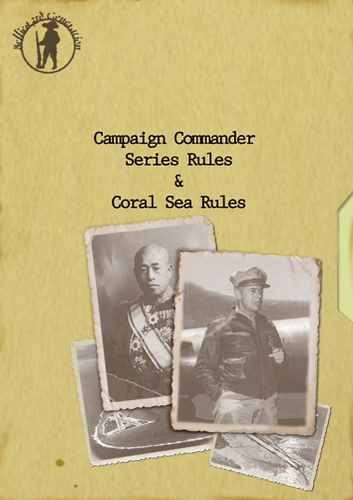 - 1 Rules Book for the Series “Campaign Commander” and Exclusive Rules of “Coral Sea”; historical and designer notes.